Rugged lava rocks with almost 300 species of desert plants and 200 species of birds make this park particularly interesting. Walk along the Oregon Trail for a quarter of a mile and see Register Rock, where pioneers carved their names and dates in rocks as they passed through. The visitor center at the park has displays of the Oregon Trail, Shoshone Indians, geology of the area, and fur trapping. Memorial Day through Labor Day, the park has Living History campfire programs which depict the pioneer days as acted out by costumed performers. The park has camping and is open year-round. 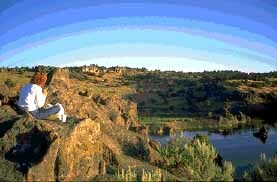 Many of Idaho's most beautiful and scenic spots are preserved in the Idaho State Parks system.